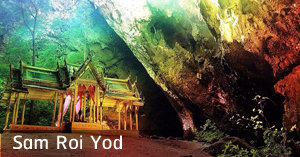 About 40 minutes drive south from Hua Hin you will find Sam Roi Yod National park. The park is known for the mountain of 300 peaks. Our tour starts from the hotel and further to the park. We start with taking a fishing boat from Ban Pu fishing village through the canal and get off on the beautiful beach where we take a walk up to the Tham Phraya Nakhon Cave. The cave has a big hole through which a shaft of light reaches and permits the growth of various kinds of plants. Phra Thi Nang Khuha Kharuhat, a Thai style pavilion, lends the most attractive sight to the cave and has become the symbol of Prachuap Khiri Khan. It is a four-porched building first constructed in Bangkok in 1890 during the reign of King Rama V.
Back on the beach having lunch and spend some time relax on the beach before heading back to Hua Hin. On the way back we make a stop at pineapple plantation and test the fresh pineapple right from the roadside.